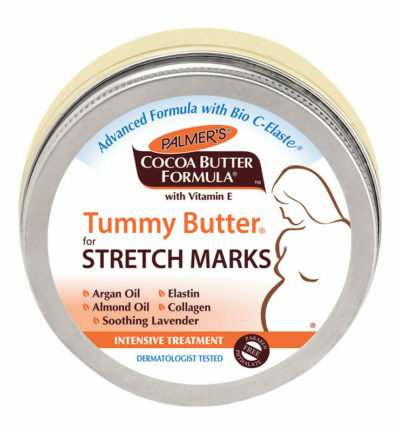 Palmer’s Tummy Butter for Stretch Marks is a concentrated butter offering maximum moisturisation while reducing the appearance of stretch marks in targeted areas of expectant mothers. Soothing lavendar oil promotes relaxation and sleep. SKU:1000379. Categories: FOR MOMS, HEALTH AND CARE. Palmer’s Tummy Butter helps reduce the appearance of stretch marks with a concentrated blend of pure Cocoa Butter, Vitamin E, Shea Butter and Bio-Elaste. Bio-Elaste is a powerful and advanced combination of Collagen, Elastin, Asiatica, Sweet Almond Oil and Argan Oil. 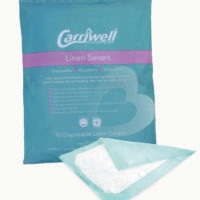 Helps improve elasticity and suppleness of stretching skin during and after pregnancy. Soothing Lavendar Oil promotes relaxation and sleep making this ideal for evening application. Hypoallergenic, paraben-free, phthalate-free, dye-free and dermatologist tested. 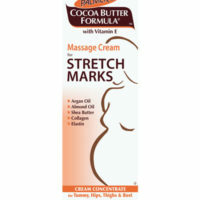 Gently massage into stretch mark prone areas 3 times a day or as often as possible.